My daughter is getting married soon. We don’t have a date just yet. She is almost done with graduate school and then I’m fairly certain that we will be planning a wedding together. We have spoken about it often and I think it is going to be one of the most wonderful things we’ve ever done together. It will be so much fun to pick out flowers and place settings and all of the other pretty things that will add to her special day. What isn’t fun is the price tag! That’s why I came up with 10 ways to save money while we plan her wedding. Weddings are great, but they shouldn’t put you in the poor house! Saving money doesn’t have to mean sacrificing the overall beauty of the big day. When you think about it, there are many little extras that you don’t really need to make a wedding beautiful and memorable. 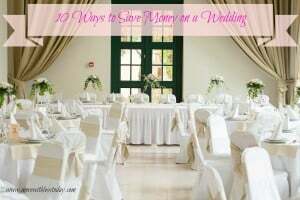 My 10 ways to save money focus on reduction or elimination of wedding extras that might be cute but aren’t necessarily required. I spoke with my friend Raquel, a savvy blogger who publishes Organized Island. Her daughter is getting married very soon as she gave me her advice for the first 3 ways to save money on a wedding. Check out items at your local dollar store.They have a wedding section with lots of great packaged decor items for just a dollar each. Establish a budget and make a pact to stick to it. Rank you priorities and talk about what can be compromised, down-sized or skipped. Book your venue first, before you send out your “save the date” announcements. Popular wedding venues can book up a year in advance. You don’t want to “save the date” and then pay top dollar to secure a venue out of desperation. Whittle down that attendance list. The less people you have, the less you have to pay per person at the reception. Decide if you are going to allow children and guests for single attenders. Also keep the head count down for the number of attendants in your bridal party. As you can see, it’s all about paring down without sacrificing the overall feel. Do you really need the extra super fancy table setting or the gilt-encrusted whatever? Probably not. If you follow these 10 ways to save money, you’ll have a wedding that is both beautiful and affordable. Guest blogger Lori Felix is a Savings.com DealPro and founder of MoreWithLessToday.com. She helps others find more ways to save money on everyday expenses and have some fun along the way. Her motto is LESS is the new MORE!